Quality awareness, environmental responsibility, service focus: At Buzil, these elements are inextricably linked. Buzil is your reliable partner for first-class and efficient cleaning, care, hygiene and disinfection products. Buzil prioritises constant further development and very high-quality products, combined with the systematic organisation and optimisation of a full range of additional services. In this regard, the internationally successful company focuses on one goal above all else: Satisfied customers and users. More than twenty years ago, the company received certification according to DIN EN ISO 9001, with the simultaneous installation of a functional quality management system. We maintain the highest standards with regard to our products and all related elements, such as how we interact with our business partners, the service we offer our customers and our future-oriented, environmentally aware research and development. In addition, we at Buzil are also ensuring uniformly high quality and transparency when it comes to processing customer queries, through the addition of complaint management to our range of services. Furthermore, we are well aware that the challenges of the market can only be faced using an integrated approach. In our entrepreneurial understanding of quality, we consciously go beyond the definitions provided by the EN ISO 9001:2008 standard. We do not measure ourselves against external yardsticks. Instead, we focus on the standards we ourselves wish to meet. In doing so, we want to outdo the standards that our customers and rivals ask of us. Our employees are the pivotal power and shaping force on the path to this level of quality. A common understanding of the foundations and goals of our quality strategy also forms fertile ground for a continuous improvement and further development process for our product quality and additional services, with the goal of achieving a high level of customer satisfaction. Instead of an abstract management system, we rely on the participation of each individual and the collaboration of all the company's departments. 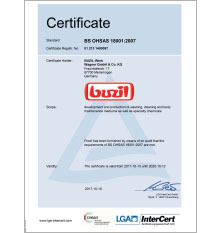 In September 2018, Buzil once again successfully achieved ISO certification for quality, environmental and occupational health and safety management in accordance with the DIN EN ISO 9001:2015, DIN EN ISO 14001:2015 and OHSAS 18001 standards. The Quality management system in accordance with DIN EN ISO 9001 defines the necessary steps companies must take in order to be able to meet customer requirements and fulfil other requests concerning the quality of products and services. safety and health protection lies at the core of occupational health and safety management according to OHSAS 18001.